Now we have trained the B-spline network and saved the weights. We can run the network with every desired input. We only have to keep in mind that the network was defined for input signals between 0 and 10. 3. Select the model 1DBSplineNetwork-Run.emx. Now the predefined model will be opened. As you can see, this is exactly the same model as used for training, but now a ramp input is used. As you can see, the B-Spline Network still has its training settings and still prompts for a weight file at the end of the simulation. Now we are going to change the settings of the B-Spline Network. 7. Click OK to close the B-Spline Editor. From the Editor menu click Model and Check Complete Model. This will implement the changed settings. 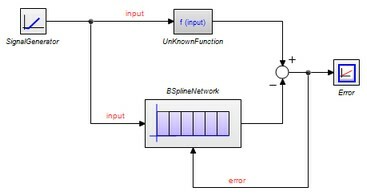 As you can see the function is approximated by the B-Spline network by 10 first order splines.